Pionner in Thalassotherapy in France, the Institute Thalassa sea & spa in Quiberon offers more than half a century of expertise and skills for a sustainable well-being. Our hydrotherapists, beauticians, sports coaches and physical trainers, physiotherapists, masseurs and relaxologists offer a wide variety of treatments and personalized support so that everyone can achieve their own goals. in our Treatments menu 2018. – The Relaxation Area offers a large heated seawater pool, a hydrotherapy pool with its outdoor whirlpool, solariums, sauna & hammams, for a total relaxation. – The Treatment Area is composed of 2 wings (La Baie & La Côte Sauvage) gathering more than 54 cabins to fully experience the benefits of seawater. – The Beauty Area has 7 esthetic cabins, 1 duo cabin and a hairdresser & barber salon, to reveal your natural beauty. – The Fitness Center has 1 cardio-training room, 3 physical activity rooms and an outdoor multisport field, to train and get fit. To offer you a wide range of effective treatments, our Institute has partnered with prestigious and recognized brands: Aquascience, Biologique Recherche, Jane Iredale, Ligne St Barth, Paris KOS, Leonor Greyl, Vitaman, Celergen, D-Lab, etc. 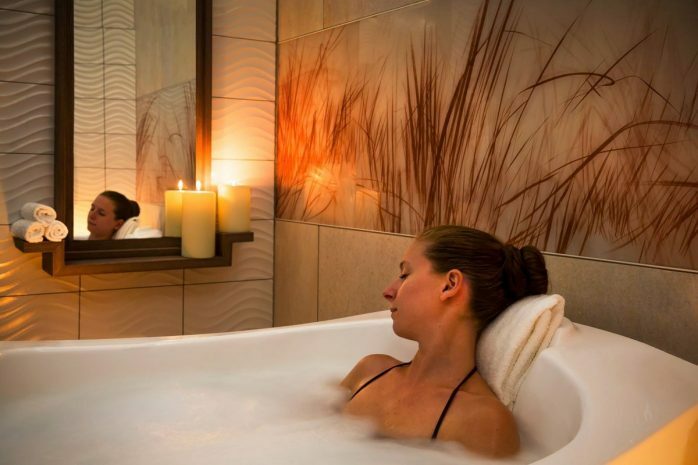 For an exceptional and exclusive experience, nothing beats our Private Treatment Suite. Located in the heart of the Institute, the Suite is cmposed of 3 treatment rooms, a warm living room and an outdoor terrace. For a day or half-day, you will experience unforgettable moments of well-being whether you are alone, with family or friends. Informations about our Private Treatment Suite and booking, please contact us : +33 (0)2 97 50 48 29.